It’s funny exactly how many recipes I have swimming in my head, how many things I’ve made once then instructed myself to go back, make it again and perfect it or even what I’ve done, loved and have yet to post even though I have the recipe AND the pictures. Was that one huge run on sentence? Why yes, it was. I’ve always wondered who exactly reads my blogs, and if they try the recipes and what happens when they do. I know as the blog grows I’ll get the answers to my question, but I think I’m what you call a.. self-conscious cook. I don’t constantly compare myself to other people, but I wonder, if my culinary chops are really up to par. I’ve never had professional training, and everything I know I figured it out by trial and error, searching the internet or by taste buds alone. It’s really nothing to look down upon, my Mother was never professional trained and she’s pretty amazing. So maybe it runs in the genes. Point is, I guess I’m scared that I’m not as good as I sometimes think I am, that my flavors don’t pop as well as I think they do and everyone who loves my food..does it because they simply love me. Why am I rambling again? I forgot, you must forgive me, there are times when I sit down and I just type. 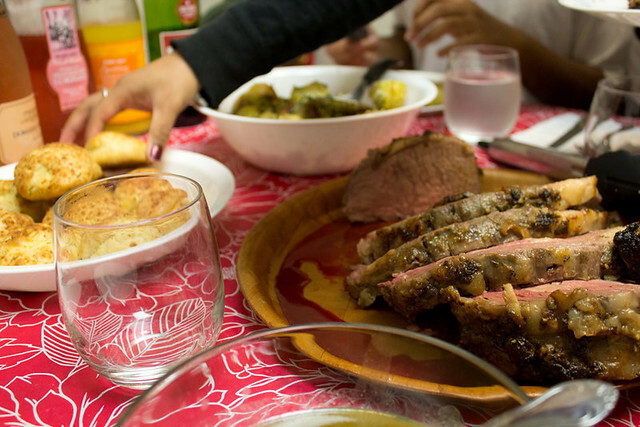 I made these beautiful Gougeres for my family’s late Christmas dinner (and over a month later, I finally post it.. I know!) along with my prime rib. I thought it would be the perfect thing to sandwich heavenly soft slices of meat in is hallow cheesy interiors, or even broken into chunks and dragged through the au jus to for that perfect bite. I’ve used pate a choux dough many times over for sweets, by why I’ve never used them for savory when they’re just as perfect for it boggles me. 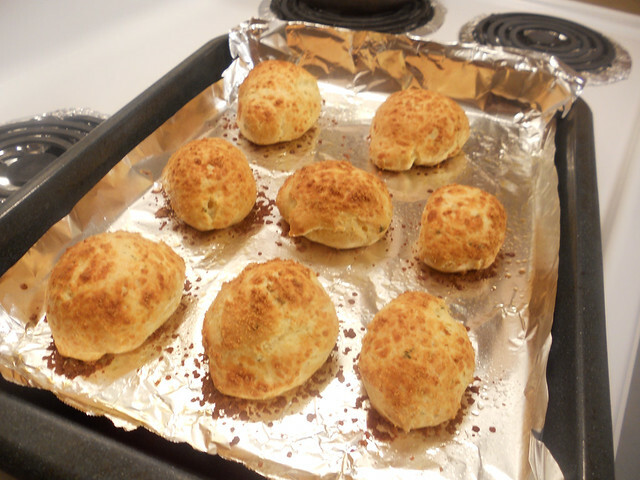 I made about two dozen Parmesan Gougeres for dinner, ended up eating at least 3 the night before when I prepared them (taste testing, I swear! ), 2 more as they were reheating and 1 at dinner that night. Yes 1 for dinner because I’m watching my figure.. err. yea! Honestly one of the easiest things I’ve ever made that yielded a beautiful elegant finish, so French, so incredibly chichi, so incredibly HELL YEA I CAN COOK!!! 3. Add all the flour and take off the heat, stirring quickly to incorporate all the flour into water/butter. 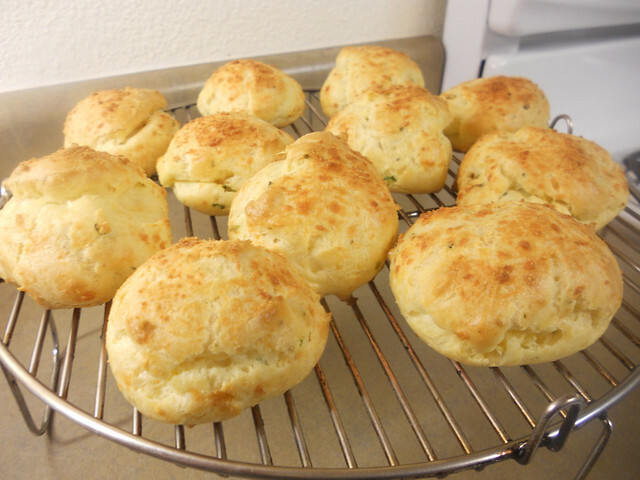 Place back on heat and continue to cook out the flour taste. About 1-2 minutes. Your dough will start to leave the sides and become a ball in the middle as you stir, a film will also appear on the bottom, this is an indication that it’s ready. Transfer to a large bowl and let cool for 5 mins. 5. Add cayenne, thyme, black pepper and Parmesan cheese, mix with hand mixer on low until just incorporated. 3. The dough is incredibly stick and intimidating to work with at times, but don’t worry, it’s just the nature of it, wet your hands a bit if you don’t want it to stick to you. 4. Great make ahead food, I made mine the night before dinner, refrigerated them; then heated them up for 5 mins in a 350 degree oven when ready to eat. They also freeze beautifully. Voila! 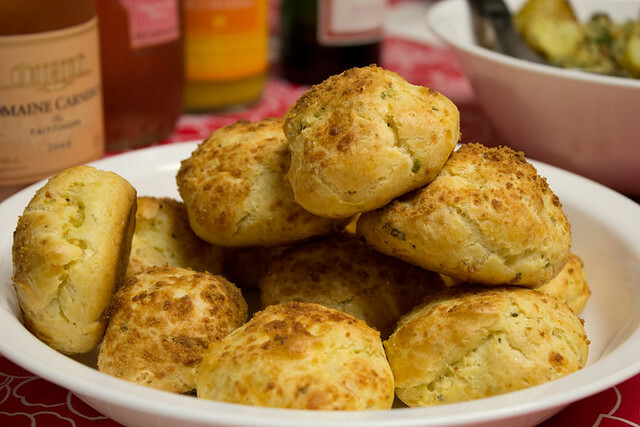 Gougeres or savory cheese puffs! Please note that these beauties are HALLOW on the inside (just like a cream puff!) and are wonderful when stuffed or torn apart for scooping things. I’m so in love with them and even my mom was surprised I made “bread”! As always..do I really have to say it again? The nice pictures were done by Vibol Vann and the rest by me, can you see the difference? It’s quite startling hmm? I really should invest in a new camera! I hope you try this and as always please write me and let me know how it turned out!